Twin Palms Guest House01493852243work Guest AccommodationTwin Palms Guest House, Great Yarmouth is a family run, friendly guesthouse and is located just 150 metres from the seafront and 100m from St Georges Park. Choose a double or family room, which have all been recently refurbished and include Freeview TV, free WiFi, tea/coffee making facilities and full English breakfasts served daily. We welcome all male and all female groups. Family rooms are for parents/guardians with children aged four and over. Twin Palms Guest House sometimes limits bookings to 3 or more days. This is located on the second floor. This has a large private bathroom located just outside the room. This is a standard double bed in the room. This is our Family Room on the front of the building it has a bay window. There is a small double (4ft bed) and a small single (2ft6). This is located on the first floor. It is an En-suite Room. Family 2 +1 sometimes limits bookings to 3 or more days. This is our small double room located on the first floor. This is a 4ft double bed with a private bathroom located on the landing outside the room. There are bathrobes provided for this room with the location of the bathroom. Small Double sometimes limits bookings to 3 or more days. This room is located on the second floor, it has a large En-suite bathroom attached to the room. This has a standard double bed in the room. Twin Palms Guest House, Great Yarmouth is a family run, friendly guesthouse and is located just 150 metres from the seafront and 100m from St Georges Park. 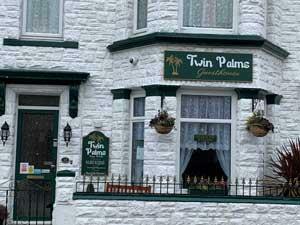 John & Gemma look forward to welcoming you to Twin Palms Guest House. Freeview TV only. Children welcome from age 4.